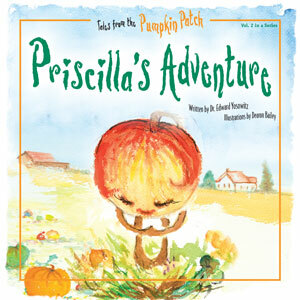 Pricilla’s Adventure, the second book in the Tales from the Pumpkin Patch series, written by Dr. Edward Yosowitz and illustrated by Dearon Bailey, is the story of a beautiful red-haired pumpkin with an extraordinary gift. At night, Priscilla would dream of singing at the New York Metropolitan Opera House. Two talent scouts discovered her beautiful voice and encouraged her to audition for the new talent show, America’s Greatest Garden Talent. With her parents’ blessing, Priscilla went to New York with hopes of making her dream a reality. Week after week on the show, audiences adored the beautiful red-haired pumpkin and her talented voice. Win or lose, she cherishes the time on the show and the wonderful experience of singing at the Met. Priscilla’s Adventure is also available in Spanish.